Facebook je web sajt društvene mreže koji je vlasništvo Facebook. Inc-a. Ime je dobio po knjigama koje su studenti u SAD-u dobijali na početku akademske godine da bi se međusobno bolje upoznali. The fun and easy guide to using Evernote for everything that's noteworthy Voicemail, email, things to do, things to get, people you know, places you've been, places to be. . . Who can remember it all? You can, with Evernote. Evernote is a free suite of software and services that makes it easy to remember things big and small using your computer, phone, tablet, and the web. If you can see it or think of it, Evernote can help you remember it. Type a text note. Clip a web page. Snap a photo. Grab a screenshot. 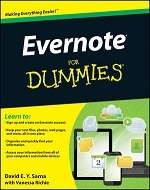 Evernote makes it easy to keep track of it all, and Evernote For Dummies makes Evernote even easier.